Hans Fallada, it seems, was a complicated chap. An alcoholic addicted to morphine [these were but a few of his issues], he didn’t live to see publication of Every Man Dies Alone , a book it took him twenty-four days to write. A remarkable feat for this rendering of the German Resistance during WWII—even taking into account the feel of the thing, which comes off as more a compelling need to present little known information, to set records straight or offer a tribute via truth/exposure, than story well crafted. Makes me wonder why he chose the fiction route given how very closely the story hinges on real events [actual notes and documents are displayed at the end]. Published in 1947, it was one of few books on the German Resistance and while it was translated throughout Europe and re-issued in 1994, it wasn’t until its first English translation in 2009 that it received serious attention and achieved best seller status. In a Nutshell: The Quangels are quiet, simple Germans. After the wife loses her brother in the war the couple set out to create an anti-nazi propaganda mission by writing and distributing postcards throughout Berlin that essentially suggest Herr Hitler is not all he’s cracked up to be and people need to wake up and smell the coffee. The cards, with various and simple messages—“Mother! The Führer has murdered my son. Mother! The Führer will murder your sons too; he will not stop till he has brought sorrow to every home in the world.”—are left in stairwells, restaurants, shops, on the street, buses, parks; the city is littered with these crudely penned warnings against Nazism and yet no one, not the police nor the Gestapo, knows who’s behind it. For a while at least. Then they find out and the Quangels are caught and executed. I was fascinated by this aspect of events so rarely heard about. However, despite the book’s more than 500 pages, I never really felt as caught up by those events as I’d have liked. I wanted to enter this world much more than I was allowed, to see those cards being written, experience a view rarely depicted. It was a time of confusion and uncertainty; people like the Quangles, ordinary Germans, saw the benefits of Hitler’s regime in the form of jobs, etc., but couldn’t shake the sense that, despite what appeared to be improving, much wasn’t right, that people of every class, race and culture were being arrested for simple disagreement. Spies were everywhere and it soon became obvious that you couldn’t entirely trust anyone—not your neighbours, friends, not even your family. This is a side of the story little known outside of Germany, and even there, only recently has it begun to be discussed among younger generations. The problem with this kind of re-telling of truth is that because we already know the outcome the fictional version must have some fresh angle—further developement of the story or characters, or even one interior journey that the reader feels privy to. 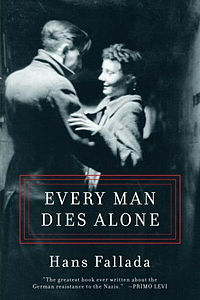 As it is, Every Man Dies Alone is written in an overly simplistic style with long passages of expository dialogue and zip character development, leaving the reader well outside the ‘world of the story’ and privy to little more than the author’s need to opine on the subject while purging his own emotions. Better, maybe, in that case to have done it as a work of non-fiction. In any case, not the world’s best slice of literature, but if you can get over that, it’s absolutely a story worth reading. And all that in twenty-four days… hats off, mate, I say. It is a sad truth that the German Resistance has received little attention. For example, the story of the White Rose — brother and sister Hans and Sophie Scholl and 4 others were arrested and beheaded as traitors. University students most of them. Brave and defiant, they used printed broadsheets to urge Germans to see the Nazi regime for what it was. I didn’t discover the story of the White Rose until researching for “Living Underground” and never read a word about the Quangels. Thanks for this. These stories need to be told because there is never just one side to a war. Never just one people that we can ‘paint with the same brush’. And courage can be found in the heart of ignorance, fear and cruelty.